March 24, 2014 -- Haiti is a country peopled with big hearts worn on their sleeves. This trip was my second with HWB, in which we got to see the fruits of the labors of many people, both from Haiti and from many other countries worldwide that have made possible the education of Haitian Homéopathes Communautaires and Birth Attendants. Three American homeopaths from the New England region flew into Port au Prince Haiti, where the contrasts are intense and immediate; the decibel level increases exponentially, a riot of color explodes as you enter life on the street. The pace in Port au Prince is akin to Times Square New Years Eve on steroids. We immediately went by microbus over steep mountain passes to the much smaller coastal city of Jacmel to participate in the second of three homeopathic training sessions for birth attendants (matrons & patrons), each of which lasts three days (1 training day and 2 clinic days for pregnant mamas and babies). Lauren Fox, FNP-BC, CCH organized this comprehensive training, and PG Legerme was the Haitian teacher of what HWB hopes is the first in a series of Haiti wide trainings to address the enormous maternal/child health consequences of 67% of rural Haitian women giving birth with no support. 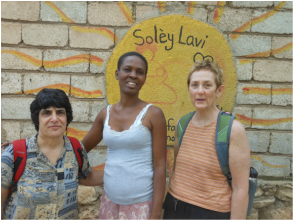 Lauren is a thirty+ year veteran nurse midwife / nurse practitioner and homeopath from MA., and HWB is blessed with her dedication to the work in Haiti. The training and clinic were well received by the matrons and patrons who attended, despite the tete chaje (problems beyond problems) that occur daily in a country virtually without infrastructure. Picture the day-to-day reality of communication in a place where a sheet of paper and a pen are on a b.y.o basis, cell phone networks are being established, where steep mountain ranges abound (1300-1600 meters / 4000-6000 ft), few people have computers, and internet & cell phone access only for those with the $$$ for laptops, cell phones and sim cards. Then there is travel- the herculean effort required to get from one place to another is simply not a reality except in very remote corners of this globe. The organizational skill of Holly Manoogian, ED of HWB is phenomenal. Not only did she put together all the details of tap tap, taxi, boat and moto travel, she gathered translators, former and current students from various regions for meetings to check in and plan strategy for moving ahead with HOMEOPATHY WORKS IN HAITI clinics and trainings. Holly’s ability to lead from behind and grow an enormous network of support for HWB’s work in Haiti has given her the distinctive title of Boss Holly by both volunteers and Haitians on the streets in communities where HWB is at work. HWB decided in a stroke of genius to institute a mentoring program for one graduate of the fundamentals program per trip to Haiti, and Esnique Louis, from Corail Lamthe was the chosen person this time. He mentored with Wendy, Lauren and Holly during the five clinic days, and underwent an amazing transformation, from quiet competence to an articulate spokesperson for the Homéopathes Communautaires and made an enormous leap in his level of clincal skills. Following three days in Jacmel we began back country travel in earnest via local boat to Belle Anse on a glorious morning along a coast studded with towering limestone cliffs. Holly, Lauren, myself, PG, and translator Fedy Cazeau arrived in town and immediately met with a group of Homéopathes Communautaires to discuss their work in the area since their graduation in 2013. They shared their enthusiasm for the work, and received continuing education from PG and Lauren on new topics in homeopathic therapeutics and grafting remedies. The next early am we adventure traveled to the remote village of Pichon and again conducted meetings with a group of recent graduates of the HWB program. We discovered firsthand the arduous journey this dedicated group of practitioners made four times to attend the trainings in Belle Anse, and were heartened to learn that they have been practicing and treating many people in their village and surrounds, with much success. A memorable moment was the presentation of a laptop computer donated by Steve Kottler of Androscoggin Homeopathics in Lewiston Maine, to Jean-Francois Louinord, for use in his clinic. The Haitian homeopaths held an open-air clinic, and worked side by side with the volunteers to treat growing swarms of local people who continued to arrive all day long until all were treated. One homeopath in particular showed his skill and perseverance that day. Esnique Louis treated thirty one people ranging in age from infants to ageless. We shared a meal with the homeopaths and then made our winding way back to Belle Anse to collapse! Our final workday was spent on another remote travel adventure to Belle Aire, a mountain village in the southeast of Haiti, where no medical help is available- period. Again, we were thrilled to meet with the Homéopathes Communautaires and hear of their success with homeopathy. “Homeopathy Works in Haiti “ they resoundingly declared en Englais! They were gifted with a professional remedy kit, generously donated by Washington Homeopathic Products, which they immediately put to use in the clinic that followed to a large crowd in a local church. We also wish to thank Cindy Balthazar and Pierre Balthazar from the Bucoseh Organization for supporting this work in the Belle Anse region.The clinic could not accommodate everyone in need, so will resume at the same time next week, and we hope will continue regularly. We were moved beyond words to see these homeopaths seen as leaders and healers in their villages, with their extended families showing up to observe with pride their family members hard at work as Homéopathes Communautaires. The work with HWB in Haiti is life affirming; I am filled with gratitude for the circumstances of being born into a culture with education, opportunity and infrastructure, and with a sense of responsibility to pay it forward to those with needs far greater than my own. There is much work to do! Holly will remain for 10 days in Haiti to establish more contacts for potential locations for the birth attendants and community homeopath certification courses as well as partnerships with like-minded organizations. Readers of this blog can know that their donations to HWB of dollars, time, laptops, reading glasses, and remedies are priceless gifts- significant contributions to growing a group of dedicated Haitian practitioners that are hard at work in communities with immense and ongoing need.